Walter and Gary (Jason Segel) are brothers, but Walter is pretty different from the rest of the world. It is only when he finds the Muppets that he feels he has somewhere he belongs. 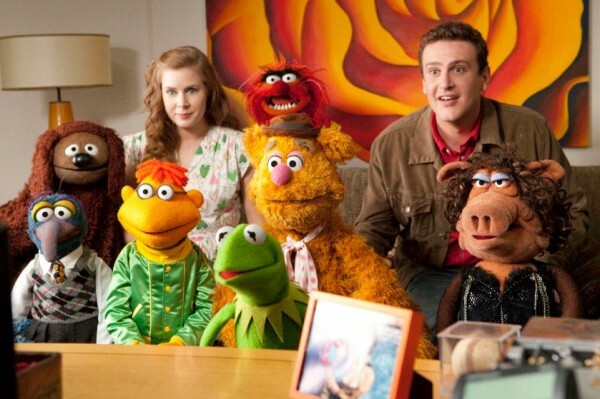 So he jumps at the chance, of course, to go to Los Angeles with Gary and his girlfriend Mary (Amy Adams) to visit the Muppet Studios. But the studio is decrepit and threatened by Tex Richman (Chris Cooper) who wants to drill for oil there. The only chance to save it all would be to get Kermit and the rest of the Muppets together to raise 10 million dollars. So Walter takes it on himself to make just that happen. I never watched The Muppets when I was a kid and apart from their Christmas Carol and a few choice youtube videos, I never really had much contact with them. So I felt like I was missing some ingredient in the whole thing (nostalgia? character background? ), but nevertheless, I enjoyed the film. I just think you would get more out of it if you were more of a Muppets fan. The thing I loved most about the film were the cameos and the general meta-ness of a lot of their jokes. There were so many brilliant little moments, though my favorite was definitely Jim Parsons‘ cameo. And the music was great, too! Bret McKenzie really outdid himself. Especially when Chris Cooper started rapping, I was in stitches. [On a sidenote: I really don’t know why I never got into Flight of the Conchords, because whenever I listen to their music I’m loving it, but when I try to watch their show, I’m instantly bored.] But all the choreographies were so extremely crappy – and I’m not entirely sure that that was intented. But as I said, the movie just lacked a certain Wow factor for me. It’s perfectly fine, so I’m willing to put that down to my general lack of appreciation for the Muppets. I just don’t care about Kermit and I never really got his relationship with Miss Piggy (I find it always slightly bordering on the offensive). And I don’t want to find more about them after seeing this film, either. But then again, that’s okay. The film is obviously made by Muppet fans for Muppet fans. I just don’t fall into that category. 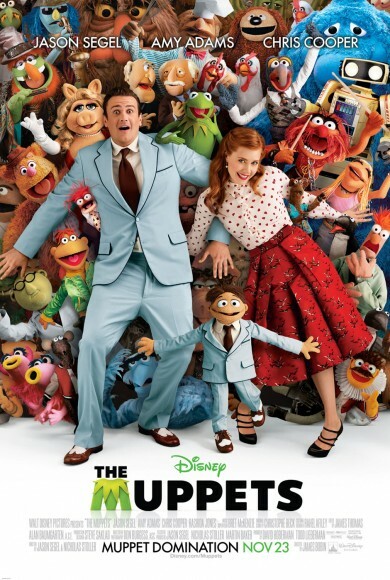 Summarising: If you like the Muppets, chances are very good you’re gonna like the film. This entry was posted in movies and tagged 2011, Alan Arkin, Amy Adams, Bret McKenzie, Chris Cooper, Dave Grohl, Donald Glover, Emily Blunt, Jack Black, James Bobin, Jason Segel, Jim Henson, Jim Parsons, John Krasinski, Judd Hirsch, Ken Jeong, Kristen Schaal, Leslie Feist, Mickey Rooney, Neil Patrick Harris, Nicholas Stoller, Rashida Jones, Rico Rodriguez, Sarah Silverman, Selena Gomez, The Muppets, Whoopi Goldberg, Zach Galifianakis by kalafudra. Bookmark the permalink. I know this film will have some annoying cameos, but I truly am excited to see these guys in action. Terrific review.